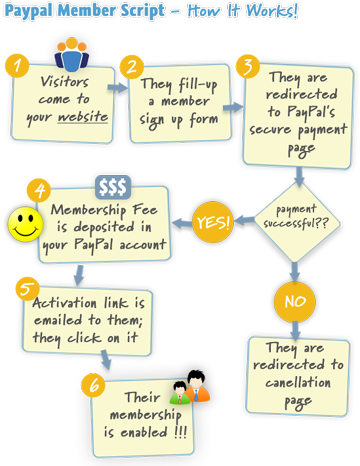 Download Paypal Member Script - the most easy membership software. It helps you to create your membership website in 30 minutes or less! 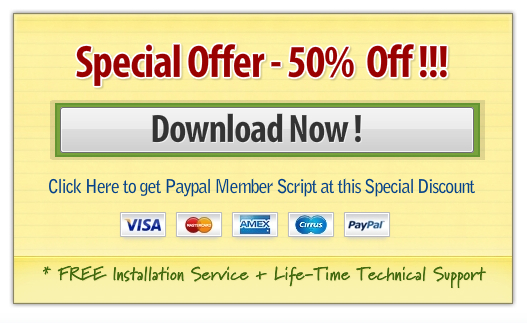 Paypal Member Script is the best-selling membership software. User's feedback have been great. You can see what our clients say about our software and service here. Download it now and setup your own great membership website today! We take customer care very seriously and we work tirelessly to make your website a huge success. We are proud of our membership software - it is really one of the most easy-yet-powerful membership software solutions available. I tried to code my own membership script for a recent client website but found I ran into trouble with the Paypal integration, email confirmations and password resets etc. So, I went online to find an easy, affordable module. I came across the PaypalMemberScript and decided to give it a go. WOW .. it was so easy, I had it up and running in minutes! I did have a couple of queries with my particular setup, so I emailed the technical support service. Within 24 hours I received a personal reply to my question. They used MY name and answered MY problem .. no automated responses!!! Got it working 100% - perfect!. I would like to offer my recommendations to anyone looking at PaypalMemberScript. It WORKS and they support you! We needed a simple PayPal membership script for a paid-file access site. PaypalMemberScript was perfect. Simple, customizable, elegant, quick to install and customer service was out of this world. I am licensing a second version today! I highly recommend this software. I have found The PaypalMemberScript software program to be the best value of quality for a very reasonable cost. Full of valuable customized features to flow with the look of your website. The very prompt technical support provided is most helpful, extremely professional, and a real pleasure to work with. I am very happy with the partnership I've developed with PaypalMemberScript, and it's developers. I highly recommend them and this program for your website membership needs. PaypalMemberScript makes my life much easier when building membership related web sites for clients. The installation guide is very simple to follow. Email questions before I purchased the script for the first time were answered very quickly. After I purchased the membership script responses to emails were still handled lightning fast. Their customer service is superb. They are highly professional. I would be well served to do business with PaypalMemberScript for many years to come. Our website was always messy and unsecure until we found the Paypal Member Script. It was exactly what we were looking for as we did not know how to automate the entire process from registration to payment by paypal and password activation. PMS is fabulous and the support is lightning fast even for minor customizations that we requested. Thank you for such prompt and honest service. You offer real value with The PayPal Member Script. I really didn't think we would get past go at the price you charged for this script and was truly surprised. It really works and the support is there too. The script is working for us and it was a nice bonus to find a feature I wanted was also included in the script, others would have quoted a price for the work which I requested.